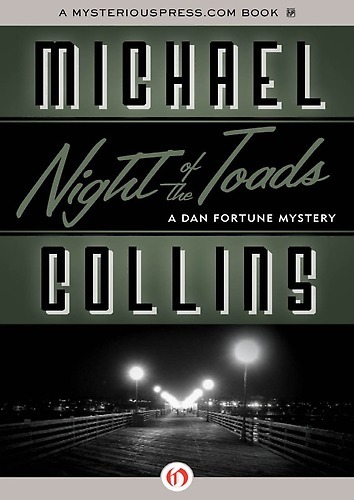 Night of the Toads is a Dan Fortune private investigator novel by Dennis Lynds writing under the pseudonym Michael Collins. Legend has it that Lynds created one-armed PI Fortune after another private eye who was nicknamed “Slot Machine.” Because of the one arm, you see. I read my first Dan Fortune novel back in high school. Private eyes have always been one of my favorite hero archetypes, and I explored a lot of writers and series back in the day. I still do, though with a more practiced and critical eye these days. I have to admit, Dan Fortune wasn’t one of my faves back when I was a teenager. There wasn’t enough action, too much circular investigation. Nero Wolfe and Archie Goodwin did a lot of circling too, but those two had a great sense of humor to them as well. I was more interested in what Archie and Nero were doing than in who killed whoever got killed that story. Re-reading this Dan Fortune novel, though, I discovered a deeper appreciation for the private eye. I’m older than he is these days, which is weird to me, but the introspection he provides during the narrative really touches home now. Night of the Toads came out back in 1970, which I remember quite well, and feels a little dated, but I had no problem being part of that world where you had to stop for a phone on the corner and information wasn’t at your fingertips. However, the emotional quandaries of the characters are pretty much the same that you’ll find in the world today. Fortune’s investigation starts out as a vengeful one, instigated by Marty, the woman in his life. She’s an actress looking for a job at a play whose director/writer/producer is a known lothario. Things don’t go well for Fortune, and he ends up tossed out on his ear but meets a woman who leaves an impression on him – who later turns up missing. Fortune is still looking for dirt on Ricardo Vega, but his investigator’s instincts won’t let him leave the woman’s vanishing unchallenged. The book covers very little ground in some ways. Fortune returns again and again to the same places and same people, but he peels back the layers of the missing woman’s life to get at the truth. I read the book over a couple nights because it’s not too long and the story moved along quickly. I enjoyed the mystery pretty well, but I think it was touching base with Dan Fortune on a different level and returning to 1970 and all the things I remember going on that really carried me through the read. The early books are all out on ebook format now and I plan on picking them up along the way. I started reading Michael Collins with ACT OF FEAR, the first Fortune novel, which won the Edgar for Best First Novel. As with most long-running series, the first 10 books are the best. Gayle, thank you very much for the kind words. It’s weird how, as I’ve grown older, I find my life more intertwined with writers I grew up reading. I still remember reading ACT OF FEAR while waiting on the school bus my sophomore year of high school. There weren’t very many readers in school back in 1973, it seems. My SF buddies hadn’t picked up the PI bug. I always loved Dan Fortune. Now I’ll have to pick them up in ebook and read again! This entry was posted on April 18, 2013 at 4:29 pm and filed under Crime,detective,ebook,Mystery,series fiction. You can follow any responses to this entry through the RSS feed. You can leave a response, or trackback from your own site.